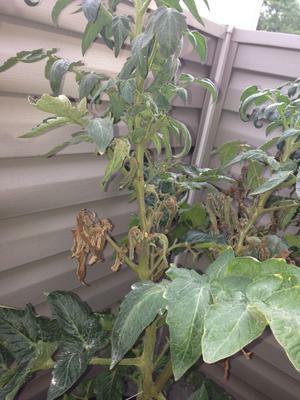 I would really appreciate anyone's advice or help in diagnosing an obvious disease that has damaged my tomato plants. If I can't find the problem it makes no sense for me to plant again next year. 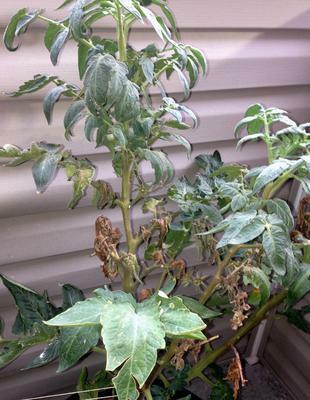 I have plants that are in pots that are of the bush Goliath variety. 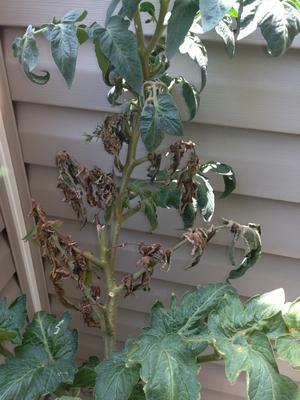 I have been watering consistently as well as fertilizing my plants and they were looking healthy with tomatoes, then all of a sudden I noticed in certain sections of each plant the leaves turning a rust color, shriveling up and dying, but yet above and below the other leaves still green and somewhat healthy. 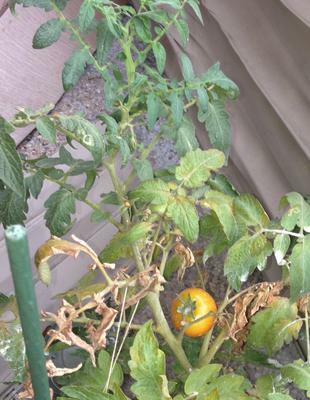 It almost looks like these certain sections have been choked without water, but that is just my opinion because when I handle the infected leaves they aren't crumbly like a dry leave would feel. Thank you so much for your time in helping me solve this problem.